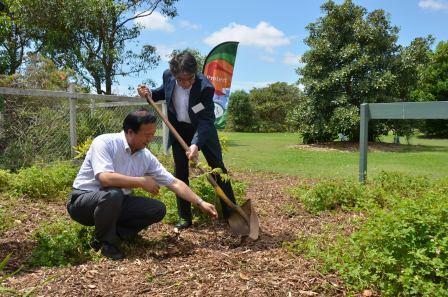 On November 6, 2015, the sister-wetland relationship between Kushiro wetlands (specifically Kushiro-shitsugen, Kiritappu-shitsugen, and Akkeshi-ko and Bekambeushi-shitsugen) and Hunter Estuary Wetlands was renewed in Australia. These wetlands originally established this relationship in 1994 to collaborate with each other on promoting the conservation and wise use of wetlands, and renewed the relationship in 2004. 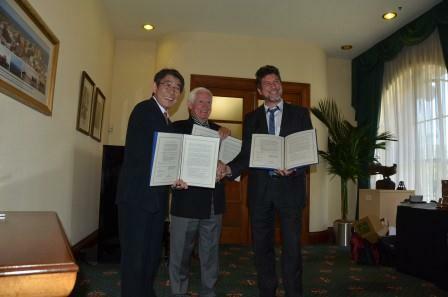 KIWC President Hiroya Ebina (Mayor of Kushiro City) visited Newcastle, New South Wales, and signed a renewal agreement on the sister-wetland relationship along with Newcastle deputy mayor Michel Osborn and Port Stephens mayor Bruce MacKenzie, reaffirming the commitment to ongoing collaboration toward wetland conservation. On the next day, Mr. Ebina visited an organization engaged in wetland restoration and planted a commemorative tree. 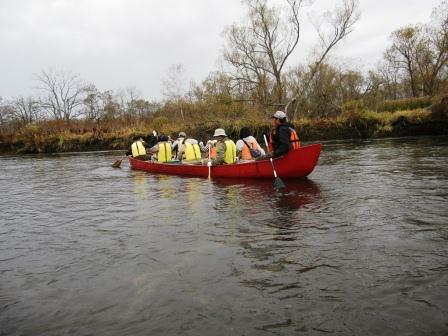 On October 24, 2015, a public participation survey on a restored river environment was conducted in the Kushiro River section where the meander was restored to a natural stream section (approximately 5.5 kilometers from Kayanuma to Sugawara). Participants canoed down the river, observing riverbank vegetation, landscapes, animals, plants and other elements of the surrounding environment along the way. They stopped at two sandbanks to examine their size and geological formations. 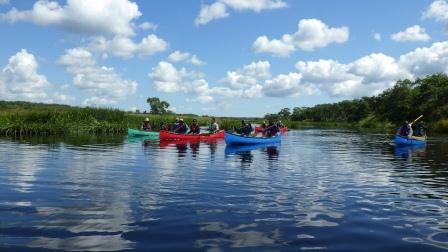 Sudden rainfall forced them to cancel some of the planned surveys and observations, and the participants worked together to paddle the canoes as fast and as hard as possible to their destination. After completion of the survey, participants summarized their findings and results. Despite the difficulty of writing down their findings while canoeing down the river in bad weather, they shared a great deal of information, such as the discovery of a mink den and the difference in water color between the two streams at their confluence. The survey, which has been conducted every summer and autumn since 2010, has revealed the effects and influences of the meander restoration. Now, local residents who are regular survey participants lead these surveys. For first-time participants, the survey provided a valuable opportunity to consider the conservation of Kushiro-shitsugen (Kushiro Wetland) from the perspective of a restored river. The event was originally planned for September 13, but was postponed to October 24 due to inclement weather. As part of an ecological management project organized by the Japan International Cooperation Agency (JICA) for Iran’s Anzali Wetland, training was provided in various parts of Japan from August 31 to September 17, 2015. The course was attended by 12 administrative officials from Iran who are involved in wetland ecological management and basin control. 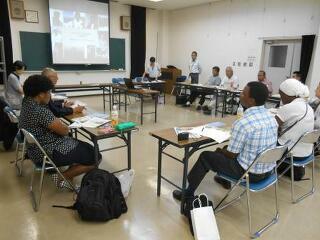 From September 7 to 11, the training was provided in the Kushiro region. 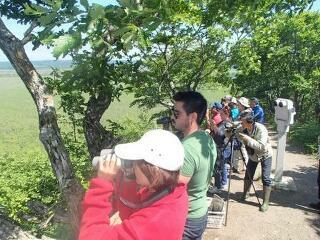 The trainees were divided into two groups to visit the Kushiro Wetland and neighboring facilities. They learned about matters such as a nature restoration project being implemented for the wetland, canoe tour operation on the wetland, and treatment methods for waste and sewerage in the surrounding urban areas. KIWC hosted a lecture and an inspection tour of the Kushiro Wetland on September 8 to highlight its history, conservation and wise use. While the attendees were at the Kushiro Marsh Observatory and the Onnenai Boardwalk as part of the tour, they were provided with commentary on the facilities’ roles in the wetland, operation and other matters, and proactively asked questions. A discussion and exchange session was held on September 11 to round off the training in Kushiro with the attendance of KIWC staff, local residents and local government officials involved in the conservation of the wetland. 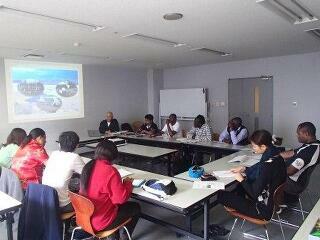 The attendees engaged in lively discussions with the trainees. Finally, the KIWC Secretary General wrapped up the session with some general comments, highlighting hopes for the development of exchanges and collaboration among people involved in the conservation of the Kushiro Wetland and the Anzali Wetland in the future. 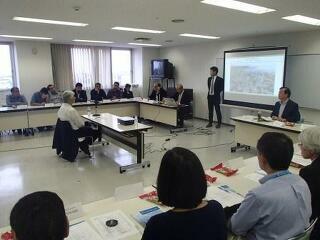 This training was run by Nippon Koei Co., Ltd. under commission from JICA. From May 25 to July 7, 2015, seven government administrative officials from Albania, El Salvador, Fiji, Mexico, Uganda and Malaysia came to Japan to learn about the sustainable use of wetland resources for local benefit. This issue-specific training program was organized by the Japan International Cooperation Agency (JICA) in collaboration with Japan’s Ministry of the Environment, and was hosted by the Kushiro International Wetland Centre (KIWC). Traveling from Tokyo to Chiba, Okinawa, Fujiyoshida, Tochigi and Hokkaido, the trainees learned about a variety of wetlands, including marshes, tidal flats, coral reefs, rivers and rice paddies. Specifically, they were introduced to activities and initiatives conducted to conserve wetlands in these areas, methods and ideas to use them for industry and education, and other efforts. 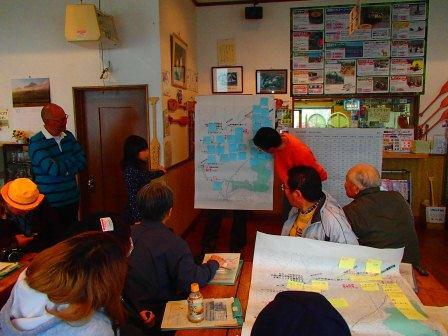 They had opportunities to talk directly with people engaging in conservation activities, local residents and government officials at Ramsar sites in local destinations including Yatsu-higata (Chiba), Manko (Okinawa) and Watarase-yusuichi (Tochigi), as well as Kushiro-shitsugen, Akkeshi-ko and Bekambeushi-shitsugen and Kiritappu-shitsugen (Hokkaido). Through these interactions, the trainees learned the background behind decisions to implement conservation efforts as well as examples of regional development leveraging wetland characteristics (e.g., branding of agricultural and fishery products, related utilization for tourism, and environmental education). Based on these various experiences, the trainees developed draft activity plans to be implemented after returning to their countries to promote the conservation and sustainable use of wetland resources and biodiversity by local residents for local residents. They gave presentations on these plans at the end of the training program.